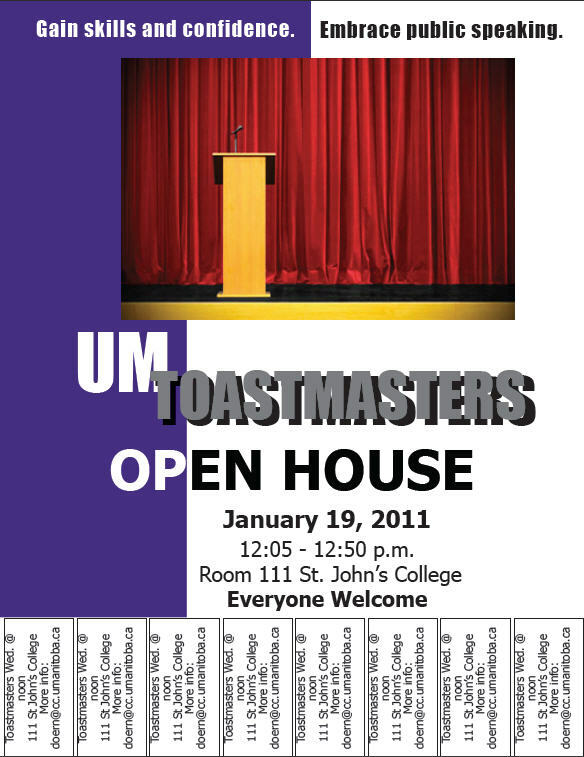 Toastmasters Winnipeg: UM Masters: Open House at UM Masters! On Wednesday, January 19 at the University of Manitoba, UM Masters will be holding an open house! The open house will be from 12:05-12:50 p.m. in Room 111 at St. John's College. Everyone is welcome to just come and sit in and experience our club in action! Of course, if you wish to participate, we certainly will not stop you! This is a great opportunity for anyone in Winnipeg to come and check out a Toastmasters meeting in action. Be prepared to see a club of enthusiastic Toastmasters take part in one of the most efficient meetings in Winnipeg! We keep it short and efficient but you also walk away learning a great deal whether you participate or not. Once again, if you're in the Winnipeg area, we look forward to seeing some fresh faces come out next Wednesday!